It’s official! We celebrated our historic One Millionth Care Package on Saturday, December 7, when it rolled off the assembly line to the cheers of thousands of volunteers, supporters, Military Brass, Elected Officials and Hollywood Celebrities. Adding to the excitement was the reveal of the special gift for the recipient of the milestone package: A Ford F-150 Pickup Truck donated by 5-hour ENERGY®. Under a large tent adjacent to the California Army National Guard Armory, Event Emcees Fritz Coleman, Andy Chanley and Joe Garner welcomed active duty Service Members and Military Veterans throughout the day. Many of these men and women were past recipients of Operation Gratitude care packages, and wore specially designed pins saying “I Serve” or “I Served.” Three previous Operation Gratitude Milestone Package recipients were in attendance: Sgt. Shaun Gallagher (300,000th package); Sgt. Eric Rodriguez (750,000th package) and Sgt. Samuel Mancilla (800,000th package). Six World War II Veterans were honored guests, including Lt. Colonel Bob Friend, a Tuskegee Airman, and Bea Cohen, the oldest living female World War II Veteran at 103- years-old. To the delight of their fans, celebrities Leah Remini, Joe Mantegna, Stelio Savante, Bill Jones, Kevyn Major Howard and cast members from the new TV show, Enlisted, joined the festivities, as did Dodgers great Al “The Bull” Ferrara, and radio host and author, Michael Reagan. Making a very popular debut as the keepsake item of the Event was the “Gratitude Journal,” a beautiful 148-page retrospective, chronicling Operation Gratitude from its humble beginnings to its One Millionth Package celebration. This classic “cocktail table-style” Tribute Book will be available to order online this week. Two Assembly Lines were in full swing, producing 3,000 care packages in just two hours. In addition, the activities included Military and First Responder Booths, fun games with prizes for young children, a letter writing area with custom printed holiday cards for the troops, a paracord bracelet workshop, and a photo booth. Attendees were served a complimentary lunch courtesy of several community organizations and local businesses. Adding a holiday touch, Santa Claus was on hand giving out gifts to all the children. The backdrop to the entire Event was the elegant and moving replica of the Vietnam Memorial Wall, presented by American Veterans Traveling Tribute. A special memorial program in front of The Wall opened with a rousing rendition of the National Anthem by the St. Francis de Sales Choir, and an inspirational invocation by Captain Brenda Threatt, a chaplain with the California State Military Reserve. Veterans from World War II, Korea, Vietnam, the Gulf War, Iraq and Afghanistan, joined Gold and Blue Star Mothers and War Dog, Cpl. Breezy, USMC (Ret.) to lay wreaths in honor of the Fallen. In a powerful and moving display, the Condor Squadron Officers and Airmen Association touched the crowd with three flyovers of vintage World War II North American AT-6 airplanes. The final flyover performed the “Missing Man” formation in honor of fallen pilots. In poignant remarks, The Adjutant General of California, Major General David Baldwin and John Barron, COO of American Veterans Traveling Tribute spoke of the sacrifices made by our Military and their families. Also in attendance representing their respective branches were Vice Admiral David Buss, Commander, Naval Air Forces, Brigadier General Vincent Coglianese, Commanding General, 1st Marine Logistics Group (1st MLG); and Command Sergeant Major William Clarke, the Senior Enlisted Soldier in California. Always a highlight of Operation Gratitude milestone package celebrations, the reveal of the special gifts for the One Millionth Care Package brought gasps and cheers from the audience of more than 4,000 attendees. Upper Deck, producer of sports cards and authenticated sports memorabilia, presented a poster hand-addressed to the One Millionth Package Recipient, signed by Tiger Woods. Best Buy, the consumer electronics giant, revealed two Home Entertainment Systems–one each for the Millionth and the One Millionth & One packages. The systems included 55 and 32-inch Insignia TVs, Rocketfish wireless speakers, Insignia digital cameras and picture frames, a plethora of Rocketfish accessories, plus iPads. 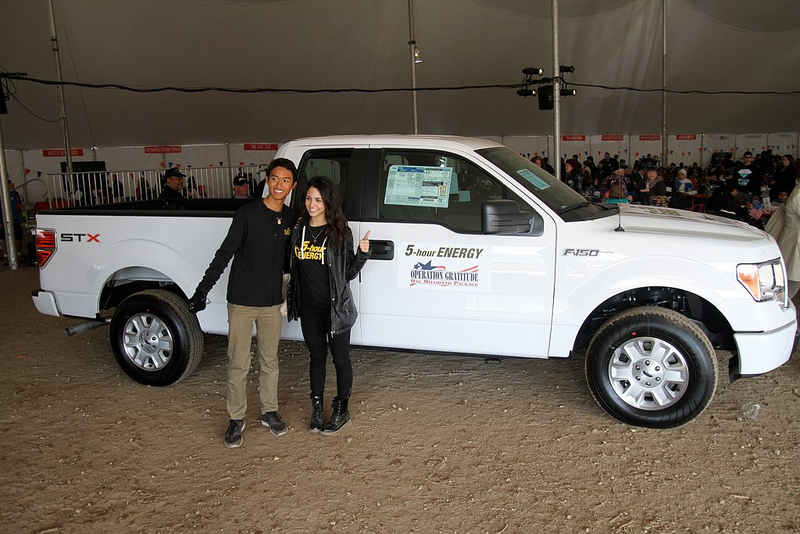 Catching the crowd completely off-guard, Living Essentials, LLC, the distributor of 5-hour ENERGY® shots, unveiled the major gift for the recipient of Operation Gratitude’s One Millionth Care Package: a Ford F-150 pickup truck. The vehicle will be delivered to the soon-to-be-revealed service member upon returning home from deployment next Spring. An exciting secret overseas delivery of The One Millionth Care Package, containing symbolic keys to the Ford F-150 and certificates for the other gifts, was revealed to the public on NBC’s TODAY Show and Nightly News with Brian Williams on Thursday, December 12. This entry was posted in Uncategorized and tagged 5-hour ENERGY®, American Veterans Traveling Tribute, Best Buy, Jim Miklaszewski, Joe Mantegna, Leah Remini, Military care packages, National Guard, NBC News, NBC Nightly News with Brian Williams, non-profit organization, Operation GRatitude, TODAY show, Upper Deck. Bookmark the permalink. 17 Responses to The Celebration! Congratulations and thank you God for all of you. I newly retired veteran who enjoyed all of your company and spirit when I had the opportunity to be a volunteer while in CA 2011-2012. Continued success and sincere gratitude! Thank you for your service…your kind words…and your support of our efforts! Woo! Way to go, Operation Gratitude! Congratulations! On Saturday, December 7, Operation Gratitude just delivered their 1,000,000th care package! Awesome! Thank you for all you do! Great piece on Op Gratitude on NBC Nightly News……….Proud of ALL of YOU!! You’re very welcome!! On to 2,000,000! Thank you to the motorcyclists who came out on a day that began rainy & cold! Your attendance & participation in American Veterans Traveling Tributes – The Wall & Cost of Freedom “Ride of Honor” was awesome. OPGrat’s founders, Managers & volunteers love & respect you. God bless! Congrats on a successful turnout. I’m glad to have donated from time to time and to have been a part of the one millionth. your welcome and lizzy sends cold noses and wagging tail your way. Reblogged this on veterans news 3.0.